Are you interested in learning how to use Docket Navigator to its fullest potential? Visit our new training center. A professionally curated litigation intelligence platform. 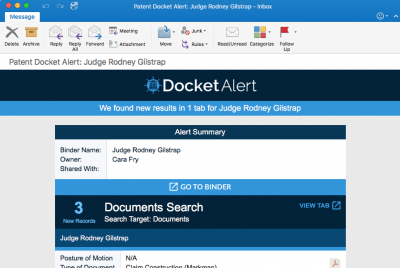 For over a decade, Docket Navigator has been a must-have patent litigation intelligence platform for more than 15,000 judges, lawyers and legal professionals. 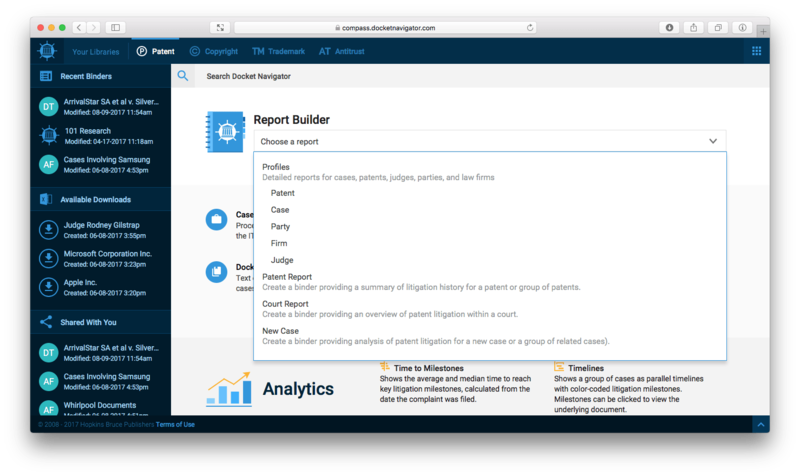 Recently expanded to cover trademark, copyright, and antitrust litigation, Docket Navigator is the only service that reports every significant event, in every case, every day. Our U.S. based legal editors curate litigation data by hand, recording up to 29 different types of data for each court document and up to 19 different types of data for each case. The result is the most detailed, most accurate, and most comprehensive litigation database available. Our daily email reports and custom alerts keep you up to date, while our research database, special reports, and enhanced analytics help you make more informed, data driven decisions. Who subscribes to Docket Navigator? Covers patent litigation in the U.S. district courts, the ITC, and AIA proceedings in the PTAB. Covers U.S. district court cases involving claims of copyright infringement. Covers U.S. district court cases involving trademark and Lanham Act claims. Covers U.S. district court cases involving federal antitrust claims. Stay current in less than 5 minutes a day. The Docket Report provides a daily bird’s eye view of our practice areas in every U.S. district court, the ITC, and IPR and CBM proceedings in the PTAB. We comb through docket sheets (usually between 800 and 900 proceedings per day) and carefully choose significant orders or pleadings which are then summarized and categorized by type of motion and legal issue. The end result is a streamlined summary of the most applicable events occurring in patent cases across the US. Conduct nearly any search in the Docket Navigator database and save the search as an alert. We’ll run the search for you automatically every business day and send you an email with new results. 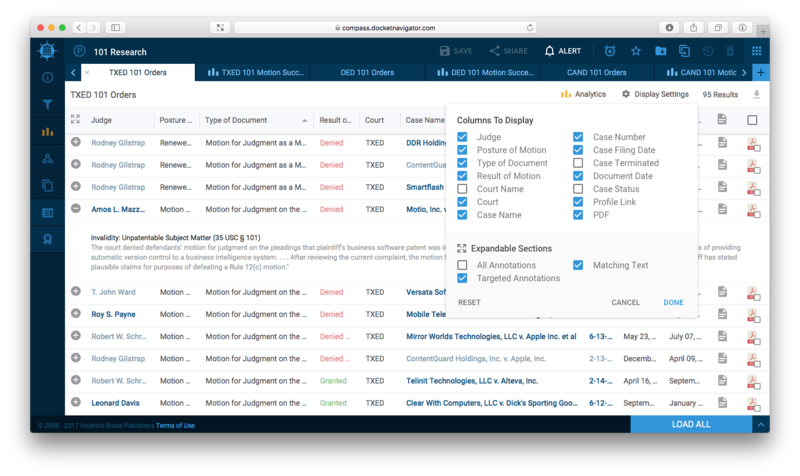 With Docket Alerts you can effortlessly track new cases involving any company or patent, new filings in any case, decisions on evolving legal concepts (e.g., §101 unpatentability after Alice), or rulings on any type of motion (e.g., motions for attorney fees). You can also reduce email clutter by creating one alert for multiple searches in a binder. 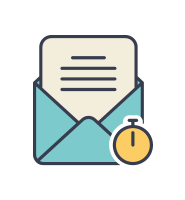 Compass will generate a single email that covers updates for the entire binder. You control the recipient list and frequency and changes to the binder automatically update the alerts. New Case Notifications are the quickest way to learn of new cases. Sent multiple times per day, New Case Notifications keep you up to date on new filings as they occur. The most sophisticated litigation data delivery system available. Compass contains dozens of new search filters that help you slice and dice litigation data like never before. Filters are intelligently grouped so, for example, you can find both denied MSJ of infringement and granted MSJ of noninfringement in the same search. Generate powerful reports in a few clicks with the Report Builder. It bundles multiple search results and comparative analytics focused on a topic of interest, such as courts, judges, patent portfolios, and law firms. It’s a great way to kick-start your research! Like a physical 3-ring binder, Compass Binders let you bundle and save searches involving similar topics (client presentation, research for a motion, etc.) in a single location. Each search appears as a tab in the Binder. Share Binders with colleagues and update as needed. Reduce email clutter by creating one alert for all tabs (searches) in a binder. Compass will generate a single email that covers updates for the entire binder. You control the recipient list and frequency. Changes to the binder automatically update the alerts. Compass is packed with features to make your job easier. 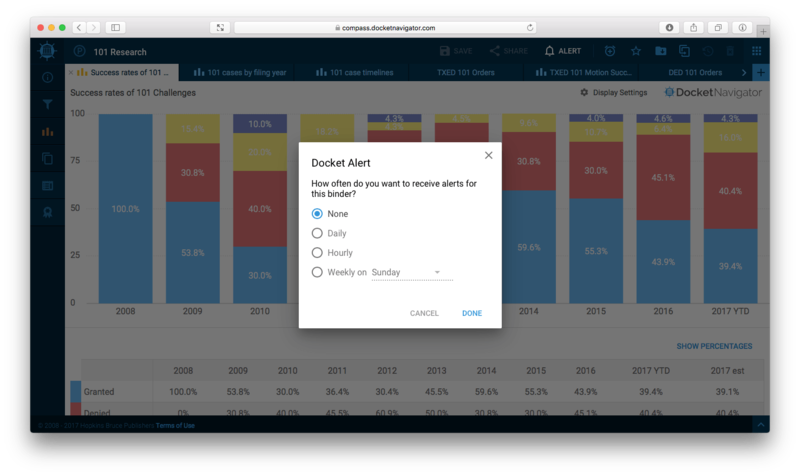 Save binders and customize alerts to share with colleagues. When you make changes, they will have the most up-to-date information. Created by our seasoned attorney editors, curated binders answer complex, multi-faceted questions about high-stakes litigation. Select multiple documents in a search result and download a single zip file containing the selected documents in PDF format. Visualize data with charts. Access analytics related to your search results or start from scratch with an Analytics search. Choose which tabs to export and Compass will generate a single Excel spreadsheet with corresponding tabs. Compass comes with our amazing customer support team to help you get the most out of your Docket Navigator subscription. 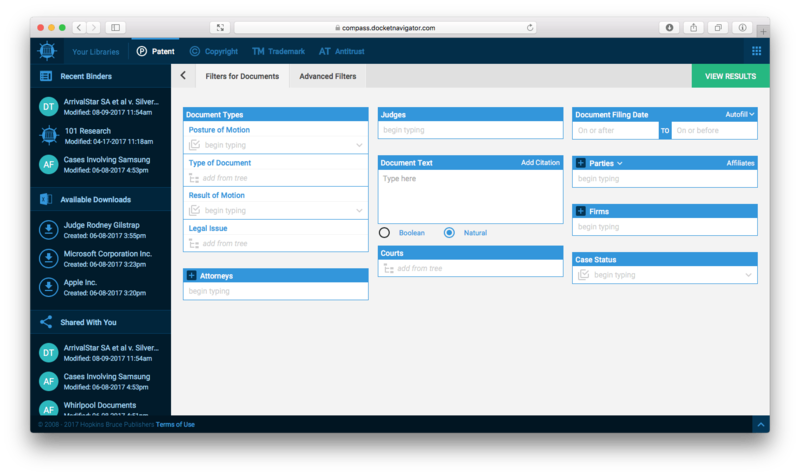 Take Docket Navigator for a test drive.